As we enter the final chapter of 2016, many of us will no doubt agree that it’s been a bit of a nutty year. Brexit. Trump. The shrinking of Toblerone. It’s as though though the whole world has woken up on the bad side of crazy, and descended into a state of utter madness. On the plus side, the flurry of 2016’s chaos has brought with it a number of insane food trends to help soften the blow, and chief amongst them, is the “freakshake”. 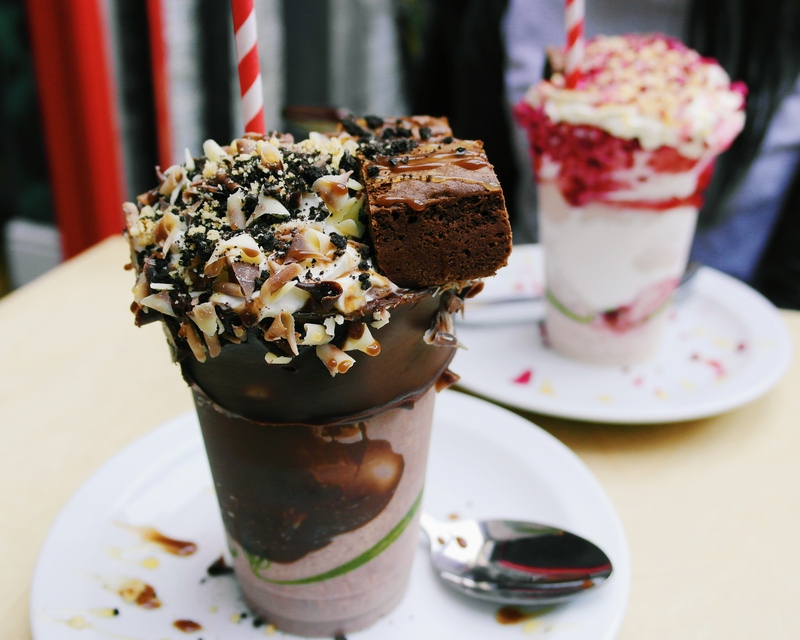 Forged in the fiery depths of hell – (Australia), these monstrous concoctions are a mashup of a milkshake, a dessert, and a deathwish, and since their original conceptualisation at the Pattisez cafe in Canberra, they’ve been massacring diets around the globe. For the UK, this violence against healthy eating began at Molly Bakes – a cafe and bakery in Stoke Newington, which in April of this year, became the first British establishment to recreate this stroke of Australian madness. Note: The marshmallows at Molly Bakes contain animal gelatine. Being the burly, masculine man that I am*, (*in my head), I had no time for frilly, flowery shakes, and so, I ordered a raspberry freakshake with a chocolate chip brownie. As you can tell from the photo, this was the most masculine freakshake in town, and as I walked across the cafe with my bright red specks of dried raspberry, I could feel the other customers quivering in fear. Steak meanwhile, had opted for a chocolate freakshake with a salted caramel brownie. Both shakes possessed a perfectly creamy consistency that was neither too thin, nor too thick, and unlike some other freakshakes that we’ve come across, both were actually as delightful to drink as they were to take pictures of. 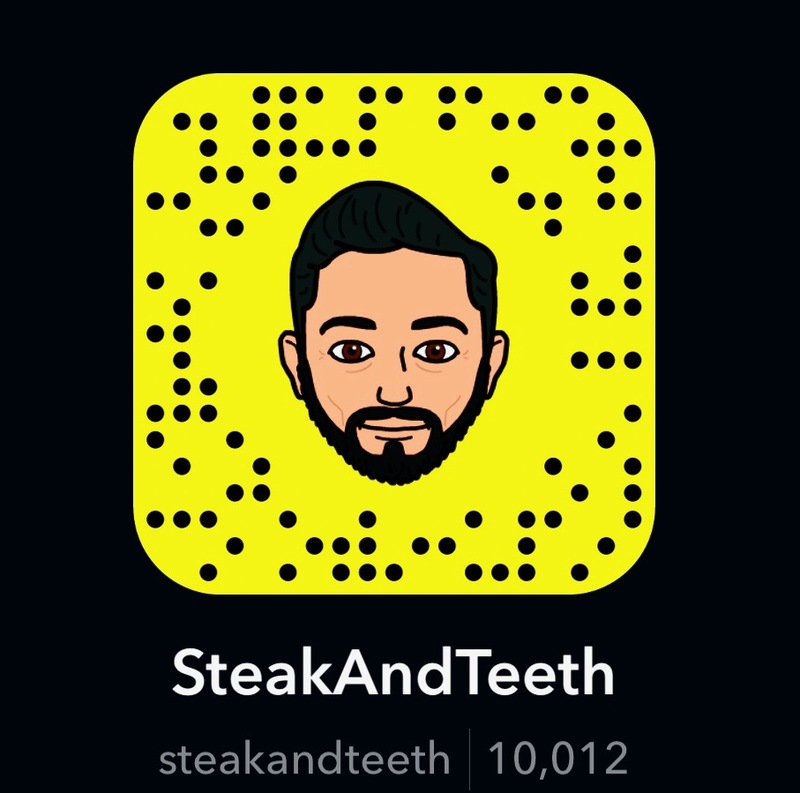 (Be honest, nobody orders a freakshake for drinking. Do they?!). The raspberry milkshake was perfectly smooth and sweet, with a strong fruity punch and a subtle floral essence, whilst the chocolate shake was pleasantly malty, and both were perfectly balanced. This meant that for once, we could finish both freakshakes without feeling as though we needed a blood transfusion and a diabetes screen. In fact, the only disappointment we came across, were the thick brownies that sat on top. Although the chocolate chip brownie was dense and rich, its centre was slightly dry, which did not sit well with my preference for soft and gooey brownies. As for the salted caramel brownie, we failed to find a distinct salted caramel flavour, and as such, it didn’t seem much different to the chocolate brownie at all. 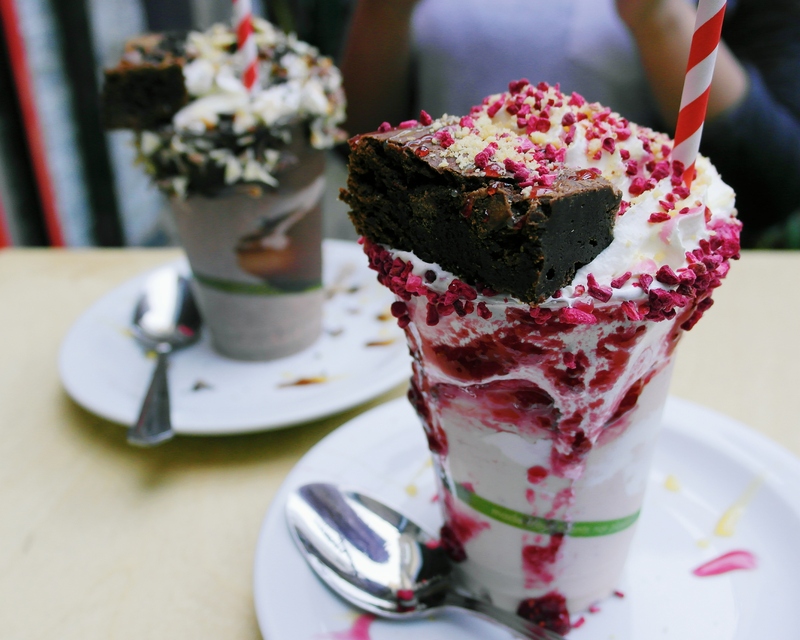 Both freakshakes cost £7 each, which is pretty much the usual price for a freakshake in London. Whilst these particular shakes may appear to be smaller and less “freaky” than others, they are in fact, pretty filling. You can also find an assortment of cakes and cookies (around £2.50-£4) sitting on the counter. Staff members at Molly Bakes are incredibly friendly and helpful, and you can expect to receive your freakshakes with very little delay. It’s worth bearing in mind however, that we visited on a quiet afternoon on a weekday, and were fortunate enough to grab a couple of seats – which are limited at best. Be aware that if you plan to stop by on the weekend, you may encounter a rather manic queue, and more likely than not, you will be ordering your freakshake to go. Over the course of the year, Steak and I have enjoyed a number of freakshakes between us, and yet, our visit to Molly Bakes was the first time that we truthfully enjoyed the chaos that we were consuming. 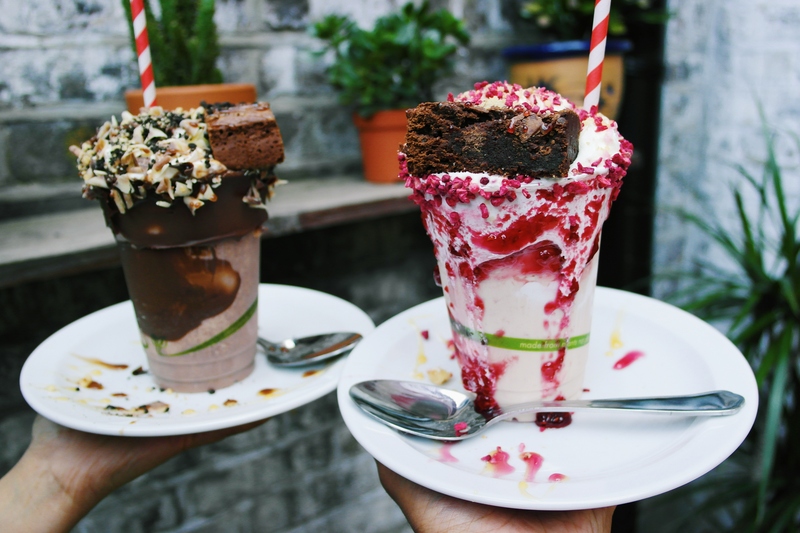 The truth is, that the freakshake has become nothing more than a dazzling spectacle for social media, and whilst that probably was the original purpose of it, many dessert bars have become consumed with the aesthetics of their creations. 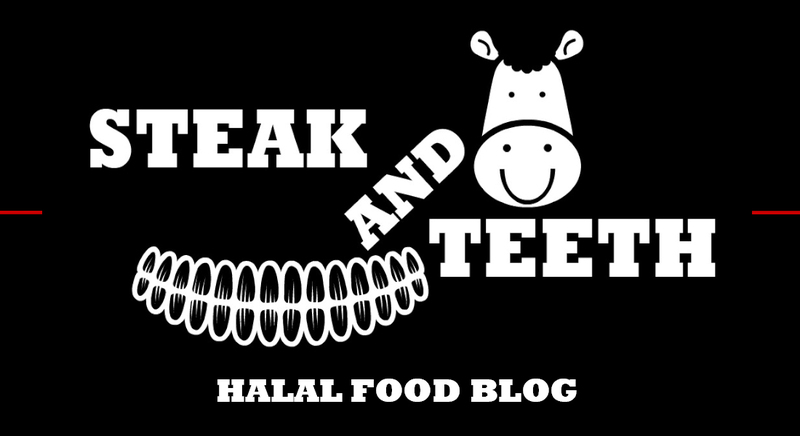 Whilst this is not a bad thing in and of itself, many have neglected the very fundamental aspect of a freakshake as a result – the milkshake. No doubt, we can all relate to diving head-first into a freakshake, only to find that we have been served a jar of weak milk surrounded by cake and cream. It is, quite literally, a tragedy, and it is one that you will hopefully avoid at Molly Bakes. Here, the shakes themselves are a delight to drink, and as for all that other stuff? Well that’s just the icing on top of the cake. (Which is on top of the whipped cream). (Which is on top of the shake). What’s certain, is that the first British cafe to serve a freakshake, is still one of the best places to get one.